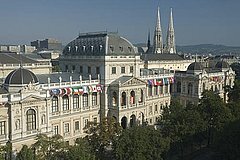 The 10th Anniversary Conference of the European Society of International Law took place in Vienna, Austria, hosted by the University of Vienna and organised by its Law School’s Section for International Law and International Relations in cooperation with the European Society of International Law. The conference was held from 4th – 6th September and was attended by more than 400 participants. The conference featured plenary sessions, fora with invited speakers, and a number of agorae with speakers selected on the basis of calls for papers. For the first time, this ESIL conference also offered poster sessions. The European Society of International Law is grateful for the support of its premium institutional members and sponsors.